"A freelancer, a freelancer, my business for a freelancer"
Such is the battle-cry of many business owners that operate in the realm of digital. Any business is bound to find itself at some time in need of additional talent to serve its customer base or ongoing projects. Unfortunately, we live in an era of recession and one cannot always justify the overhead that comes along with acquiring good talent, let alone training them and retaining them as part of the business. While common sense and ancient wisdom might teach us that true champions appear when things are most difficult, this blog is not about an inspirational story of hope and victory of hardship. This post is about those freelancers that we hire to come to our rescue, only to wish later we had succumbed to our misery. There is a certain consolation in failure when the alternative involves another flavor of failure garnished with a side dish of having one's intelligence insulted. The time traveler freelancer possesses great powers that allow them to take on a huge number of projects at once. Like the iconic Terminator sentence: "I'll be Back" they are often heard uttering the sentence: "You'll have it on time". By warping the time-space continuum, they can deliver flawless work on short deadlines, while juggling their personal and professional life at once. Of course all of this happens in their own mind and in reality you the business owner are left 2 heartbeats away from a stroke. In psychology the bipolar is often illustrated as someone that can go from being very happy to very depressed very fast. Like in psychology, in freelancing The Bipolar is a very delicate type to handle.They can go very quickly from calling you and begging for work "because I really have a lot to pay this month" to walking out on a project after having started it "I really should stop taking such projects". Scientists are still baffled by this but my building janitor explained it in a few words: "maybe he doesn't have a lot to pay anymore"
Like the cake with the same name this freelancer is usually rather sweet and like the flower, very delicate, but also like any other lazy person out there, utterly useless. You criticize their work and they will not object, you email them your grievances and they reply back acknowledging that, and always gently and nicely without breaking a sweat or in Layman's terms without giving a damn. Nothing can come out of collaborating with such a person who is surely as useful as an ashtray on a motorcycle. This freelancer always needs to be in the spotlight to look their best. They excel at first impressions by highlighting every possible angle to their advantage so they can blind you with the reflection of their awesomeness. Take them away from the pedestal they set themselves on and all they are is fragile pieces of glass that cannot handle pressure and have little value beyond being ornamental. That bird won't fly in the business world and just costs too much to do nothing. The handyman freelancer can help you with just about anything. They can develop websites and app, do your accounting, bring you sales leads, advise on what type of surveillance cameras to install, throw some stock exchange tips your way, do a 5 years product roll-out strategy and even fix your Nespresso machine*. But when push comes to shove, this is the last person you want to resort to because as much as patchwork may be trendy in the textile industry, it's not how you want important work done. *I threw this last one in just in case they notice me and have another useless artifact they want bloggers to write about in exchange for some freebies). If you are wondering how you can avoid falling on one of these 5 types, I am afraid there is no easy way around it. Like the rest of us, you will have to go through the process of hiring, failing and learning. 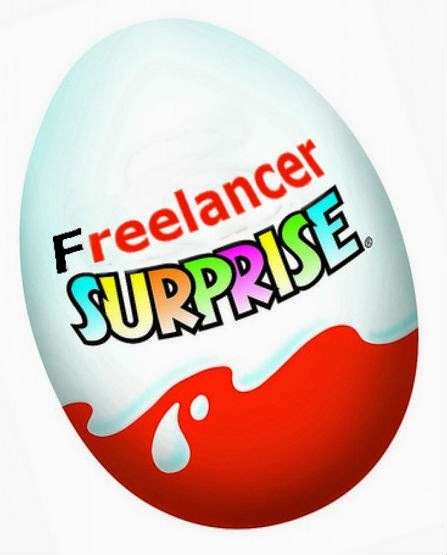 Think of it like buying a Kinder Egg, you never know what's the gimmick inside but you are always certain you are going to be excited at first, you are going to waste some time putting it together and you are likely to do this again even if the result is disappointing.